--Thin Apple Tart over Chopped Thyme (really!) on (frozen) Puff Pastry, with Walnuts and Honey that we brought back from Auvergne. Rhoden is the Marcella Hazan of the Middle East, and Hamersley's book is just infallible. I developed the tart myself; the secret is to sprinkle chopped thyme under the apples (I got that excellent idea from Susan Herrmann Loomis's On Rue Tatin) and to cut the apples into thin (1/8-inch) slices with a mandoline. The secret to the lamb shanks (and any other lamb shanks and most stews) is to prepare them the day before and to remove the fat and reheat in the oven before serving. This makes life simpler and the taste is improved by the night in the fridge. Last night my wife and I went to Elio's, an excellent and very popular East-Side Italian restaurant, for the millionth time. We have been going to Elio's since shortly after it opened, in the 70s. 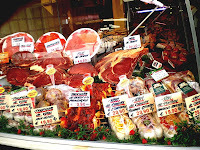 The food is consistent and they make the best renditions available of some classics, such as Chicken Scarpariello and Paillard of Veal. Last night I ordered the Porcini Porcini Secchi (dried porcini) and it was not just good, it was ABSOLUTELY PERFECT! Great texture, taste and seasoning combined to make this one of the great dishes -- seemingly so simple when it works. While I don't generally review New York restaurants, it is worth recognizing perfection whenever you find it. My wife is an avid tea drinker. She likes black, herbal and, to a lesser extent, green teas. When we lived in Paris in 1978, we were surprised at the poor quality of the tea served in restaurants: a lipton tea bag if you were lucky. 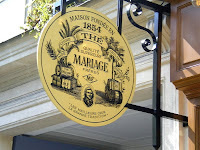 Somehow we didn't discover Mariage Frères, which has been selling fine tea in Paris since 1854, until much later. What a shame, because MF is one of the great tea purveyors in the world. My wife always keeps the Mahé and the Earl Grey French Blue in stock, but she has enjoyed many other MF teas. 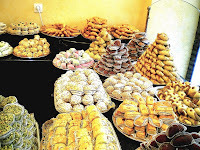 Probably the most amazing part of their selection is the dazzling variety of Darjeelings, which are prominently displayed throughout the stores. 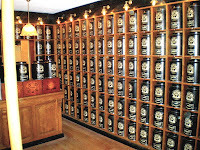 While selected MF teas are available in department stores in Paris and elsewhere in the world, there are only four proprietary stores in Paris which stock all the teas in their extensive catalogue: 260 rue du Faubourg St-Honoré (8ème), 30 rue du Bourg-Tibourg (4ème), 13 rue des Grands-Augustins (6ème) and 17 place de la Madeleine. All but the Madeleine store also include elegant tea salons, where you can taste any of MF's teas as an element of a (generally quite good) meal or light collation. Each store also sells an array of expensive tea pots and utensils. Tea has improved all over Paris, and most restaurants now do better than Lipton's. But Mariage Frères reigns supreme. It is definitely worth the visit to one of the main stores, where you can stock up on tea for yourself or for a friend; they sell wonderful pre-selected gift packages, but the knowledgeable staff can help you make up a custom arrangement if you prefer. 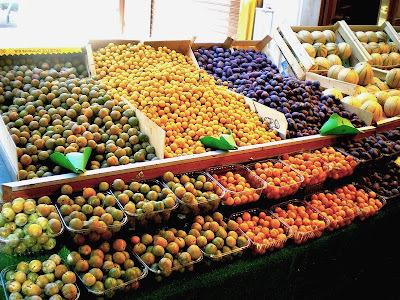 At the suggestion of a good friend, I went last week to a very nice market street on rue Daguerre, near Place Denfert Rochereau (Métro Denfert Rochereau). I had never been to this quartier before, but it is a very pleasant, airy, bourgeois Paris neighborhood. The market street is short but has what you need, and with apparently excellent quality. I plan to return for a more leisurely walk around, with a guidebook in hand to make sure I hit the highlights. 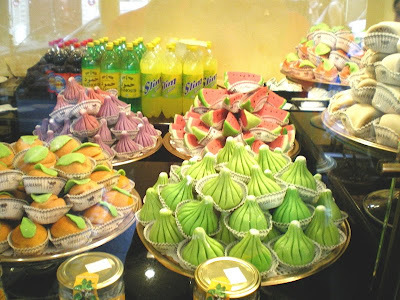 I recently went to La Bague de Kenza, an Algerian pastry shop in the 11ème arrondissement (there is another in the 3ème), and was blown away. I learned of this place from Barbra Austin, at www.serveitforth.com and recently went there with a new friend (Elizabeth Bard, www.elizabethbard.blogspot.com) who knew it well. In addition to the pâtisserie, there is a tea salon next door. 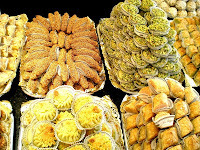 The selection there is meager, but it's okay to go into the pâtisserie and tell them its for next door. A selection of pastries and mint tea makes for a memorable Paris experience. 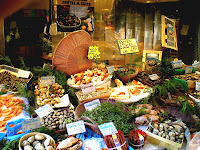 La Bague de Kenza, 106, rue St. Maur, 75011 Paris (Métro Parmentier or Rue St-Maur).